First, let me preface my review by saying this: Though not explicitly stated in the book's description, upon reading, I have come to the assumption that this book was written and intended for children. 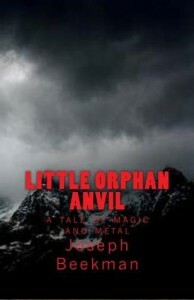 Therefore, I will base my review upon that assumption.Little Orphan Anvil says that it is about an orphaned robot. While the robot does play a big part in the storyline, I felt that the story itself focused more on the two human characters: Will and Sonny.Overall, I liked the story. I liked the relationship between Will and Sonny (and Ranger, Sonny's loveable, amusing dog), and I really got more interested in the story once they started their journey. However, I found the beginning to be a bit rushed. The Prologue and the first couple chapters were a little confusing to me, only because they seemed to jump around a bit, but once Will and Sonny meet, I feel that the story settled into a more acceptable pace.I didn't find the storyline or plot to be too complicated, and it was possibly a bit predictable, but I found it to be appropriate if the intended audience was younger children.The end seemed to tie things up fairly nicely, so I'm curious to see what the next two books could be about.